This ad in July 1943 - war time- appeared when Model Ts were still in every-day use. GIs told stories of the product. I remember it well. But I don't eat it anymore! I also remember eating rabbits which my dad raised. We ate the rabbits and he sold the fur. My uncle raised pigeons, and I remember eating them too. The points were only for meat you bought at the market. You could eat as much meat as you wanted if you raised at home. I haven't eaten rabbits or pigeons since WWII either! I love spam, pineapple and cheese sandwiches. I also like livermush so, what does that say for me. Spam is the answer to getting rid of ISIS. B52 Bombers dropping cans of Spam. Either that or carpet bombing with millions of Pigs in a Berkha. I don't think anyone outside of the Carolinas has ever even heard of livermush. I don't eat liver, but, I like livermush! Yea, I can eat livermush to if it aint burnt to a crisp. I like Spam but dont get it often. The store brand is about as good and cheaper. Spam and cheese jamb sandwich. A slice of Spam, a slice of cheese. Jamb them together and eat. My dad was in the Philippines in WWII. There was a dock strike on the west coast and the only meat they got for 6 weeks was spam. He told me that the cooks tried every way they could think of to disguise the fact it was spam. Even after that he still liked spam cooked with onions. When I was a kid I HATED that damned spam. It was awful. We ate a lot of pigeons and squirrels but not many rabbits. I like the gizzards from the squirrels, but I just hated spam. We love SPAM too........but get the low sodium variety which tastes even better than the original too. and MORE SALT ! Never liked it myself. "Grandma, ... you have really icky mayonnaise" ! YUCK~! Miracle whip. The miracle is that it is still being made! I think cat wiz would complement a sandwich made with that mess. There is only 1 Mayonnaise, and that is DUKES! 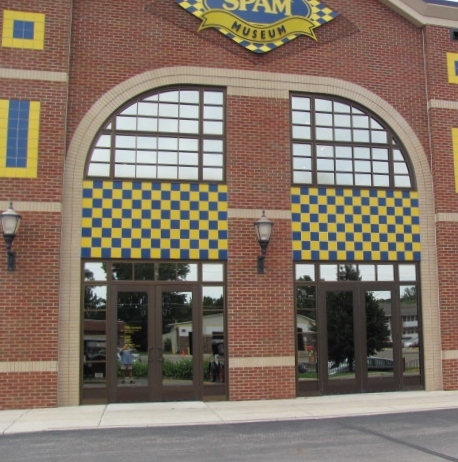 On T tour a few years ago did the Spam Museum in Rochester MN. The whole entrance wall was Spam cans! And free samples! Actually the newer 'spiced' versions are good, esp. the Bacon flavor SPAM....bacon makes anything taste good! I love spam, and cheese sandwiches with plenty of miracle whip and a little tapatio hot sauce and a cold beer. Just a heavenly lunch, I must be really strange. Harv. Obviously no spam filter on this site! that NOTHING is beyond human reach. Good, bad, or otherwise ! When I was 9 and 10 years old, I took on raising rabbits as a 4-H project. Soon the family enjoyed rabbit pretty often and Pop was selling rabbits regular to hospitals around for something called the "Rabbit Test." When my dad died in 1954, being out in the country my older brother let all the rabbits out. In 1966 I went back to take a picture of the house and saw several nice rabbits running loose. Oh yah, sorry I got off the tract. In the Army I grew to hate SPAM and I never have eaten rabbit because all I could think about is those I raised. 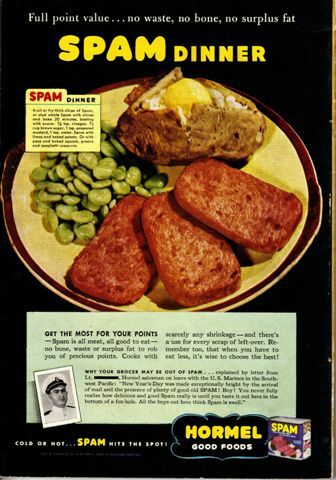 I remember Spam and eating it during WW II. It was OK but my memories don't inspire me to go out and buy some more. 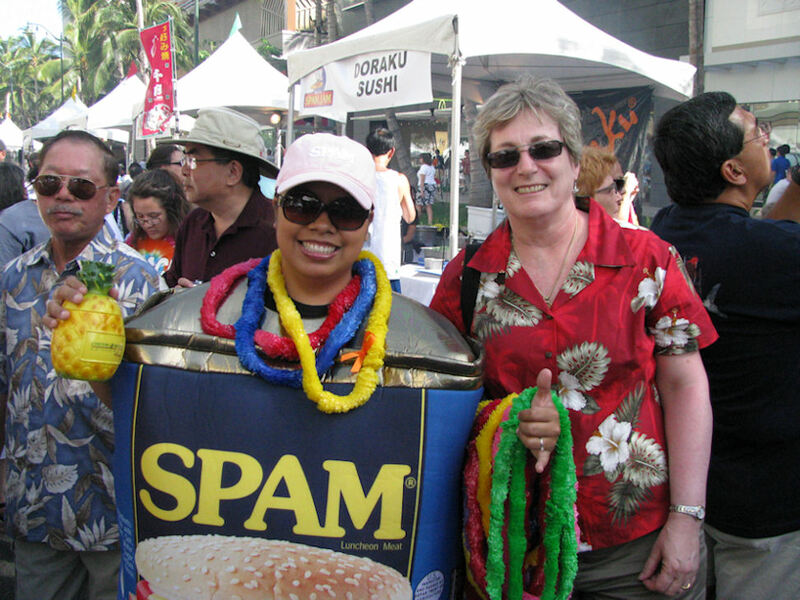 If you are in Hawaii, don't miss the Spam Jam!! It is a big even there. their efforts into recreating the cigarette "glamour" in Third World markets outside the view of the American public. Spam -onions-Mustard-Minced garlic-Rye Bread and a cola Drink or even a Cold Beer! After reading all these posts today, I just had to run to the store and buy a can of SPAM. Boy are the dogs and I in for a treat for lunch tomorrow.. Some of you just don't know what you are missing. Harv. Any where east of the Mississippi River it is said that you can't get GARLIC Spam. Last year my better half had some sent in from Korea that was made with Garlic. Her sister who lives in Lee's Summit, MO says she will send us some if we would like. One of my long time, lesser but still favorite, sayings, is "Some things are best left not thought about too much". I say to myself every time I buy some. And I still enjoy it. I tell myself the same thing every time I toss a Costco deathdog down my neck. Love SPAM the British said it stood for S pecially P rocessed A merican M eat. Onions & Mushroom with mine please. Another spam lover here. The wife makes a Reuben casserole with spam that's yummy. Donnie's right. Put in enough onions and even roadkill is good! Used to use Spam for catfish bait. they loved it, me not so much. Those are some really sophisticated catfish you catch. They know a good thing. Harv. Next spring or about 4/20/2015 i hope i remember to try using spam for catfish bait!The cat's are put off their feed from mid November by the cold! Bud. 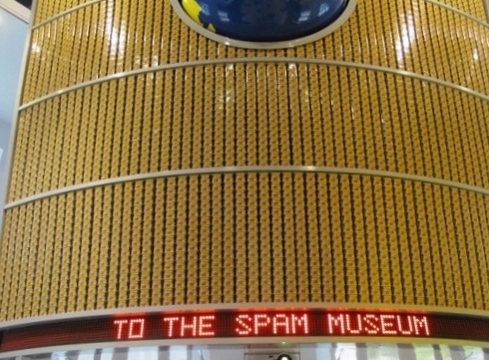 Just an FYI - the Spam museum is not in Rochester, MN. Hormel Foods headquarters and the Spam museum are in Austin, MN. I LOVE SPAM. A couple of years ago we even celebrated SPAM's birthday at our car show. We grilled SPAM burgers for everyone. We also visited the SPAM Museum. Yesterday a close friend sent me a framed SPAM ad from a 1941 National Geographic Magazine. This will hang in my shop next to the SPAM Lottery ad and SPAM license plate. 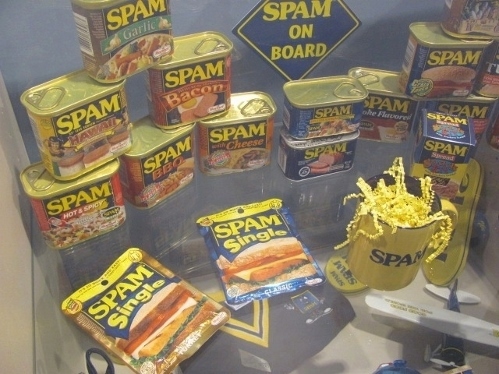 We always have a can or two of SPAM in our home and RV. Grilled SPAM, Swiss cheese, onions, mayo on toast, mmmmmmmmmmmm. When this thread first started, I immediately remembered a comedy skit from oh so many years ago. When you posted the link above? I hoped. Alas, it was not to be. However, it was also very good. Thank you. I have seen so little of Monty Python's stuff. Years ago, I was far too busy living, and didn't watch much of anything unless it was historic in nature or fact. Since, now, I don't watch anything like Monty P because my wife can't stand that type of humor. I enjoy it. I do not know if the skit I saw long ago was part of the Monty Python family, or not. What I remember, is a woman sitting at a table with others around, shouting "Spam, Spam Spam! I don't like Spam! Its Spam for breakfast, Spam for lunch, and Spam for dinner! I hate Spam!" Then goes on a bit from there. It was a British accent and very much in the M Python style. Maybe some day I will try to look for it. Try it smoked while you do some ribs, Put it on about one hour. Gives you something to eat on while you are waiting on the ribs. O by the way, Happy Ho Ho to everyone, and a happy new model T year to everyone.